Indigo provides higher education institutions the data they need on "who" their students are. Our solution is multi-faceted - used by a wide variety of departments for student success. We specialize in working with engineering and technical schools. The most comprehensive assessment tool on the market: 4 sciences in one assessment. Over 150 non-cognitive data points to use as part of your university’s retention models and research, with the option to co-create custom demographic questions to enhance data collection. 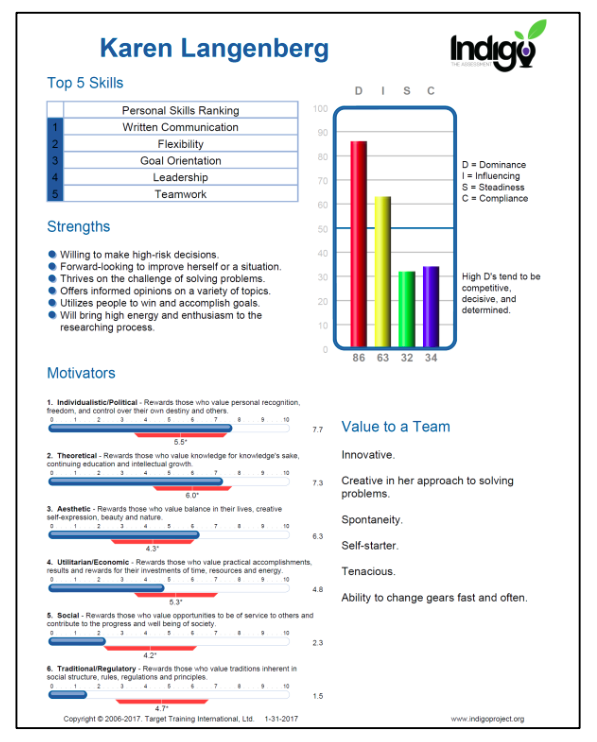 Leverages tools similar to those found in StrengthFinder, Strong Interest Inventory, MBTI, and Hartman Social- Emotional indicators to provide a more complete picture than any other technology. Assessment reports and video library link a learner’s individual results to potential “right fit” majors and careers. Indigo’s proprietary dashboard platform allows educators to understand their community of learners in the aggregate. Retention efforts (especially in STEM / engineering programs). Leadership courses and honors programs. Student-athlete team and player development. Identifying potential entrepreneurs for innovation initiatives. Wrap-around support programs for at-risk students. Online Indigo Assessment Survey with automated report delivery. Secure cloud-based dashboard that aggregates data for staff review. List of students with high entrepreneurial potential. Custom student workshops and consulting on course integration. Online course that can be integrated into an existing class or used as a stand-alone. Deep training and certification for advising and coaching staff. Whether it's the entire Freshmen cohort or just a senior capstone class, the selected group of students start by taking the Indigo Report. Conduct workshops for students on how to use the Indigo insights & leverage their strengths to excel in college & their post-college career. We run and present data analytics that are used to highlight trends relevant to improving retention & predicting academic outcomes. Since each University is widely different and faces a diverse set of issues, we will work with you in building a strategy to tackle on any problems or initiatives you have in mind using Indigo as the catalyst in driving the change forward. 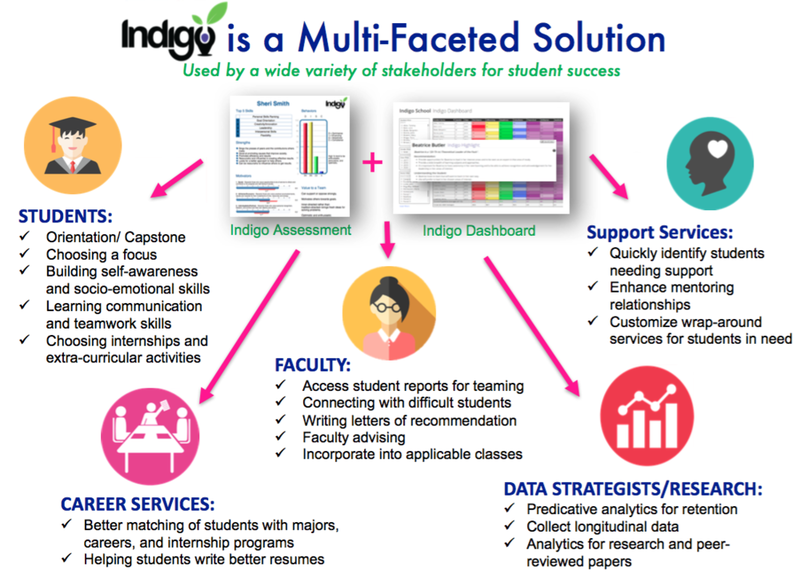 Contact us to learn more about how Indigo can integrate with college programs. University of Denver takes a deep dive using the Indigo program and analytics.